Early in August Mr Bruce sailed for New York to deliver the Grand Army Chautauqua Address at the request of Bishop Vincent, Chancellor of the Chautauqua Assembly, where over five thousand people, army veterans and their friends, were gathered, with the late ex-President Hayes in the chair. It was in this address that Mr Bruce first publicly announced his idea of a bronze statue of "Lincoln Freeing the Slave," as a fitting monument in Great Britain — this being the final act of Saxon freedom. Mr Henry R. Heath, a veteran and lifelong friend of the Consul, was present. He entered heartily into the idea, and was made chairman of the committee of arrangements. 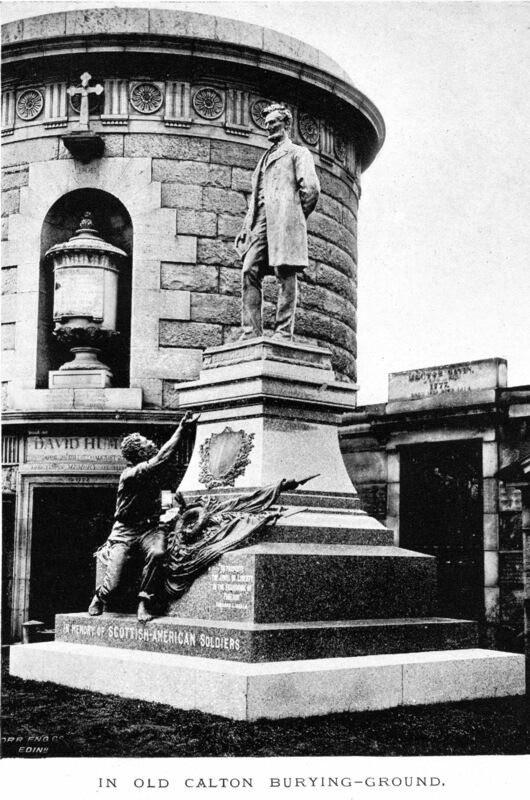 Estimates for the monument ranged from six thousand to eight thousand dollars. The contract was awarded to Mr George E. Bissell, a well-known sculptor and army veteran. Mr Bissell estimated the exact cost of the bronze figures at four thousand dollars, and agreed to furnish them at this price if necessary. The granite work was estimated at about one thousand dollars: proposals came in varying from about one thousand to twenty-four hundred dollars. Messrs Stewart M'Glashen & Son, of Edinburgh, undertook the stone-work and lettering for about nine hundred dollars. 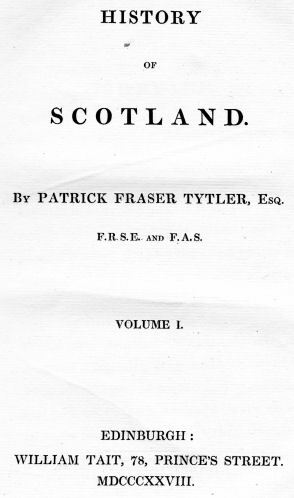 Mr Bruce then issued a prospectus with a picture of the proposed monument, and before taking the steamer for Edinburgh last November, personally saw thirty men who agreed to give one hundred dollars each. During the months of December, January, and February, the amount subscribed reached six thousand dollars, which is gratifying to the Committee, as it enables the sculptor to get some recompense besides fame for his labour. Thus, in ten months after announcement, the work was accomplished, and the monument was unveiled on Monday, 4.30 p.m., August 21st. 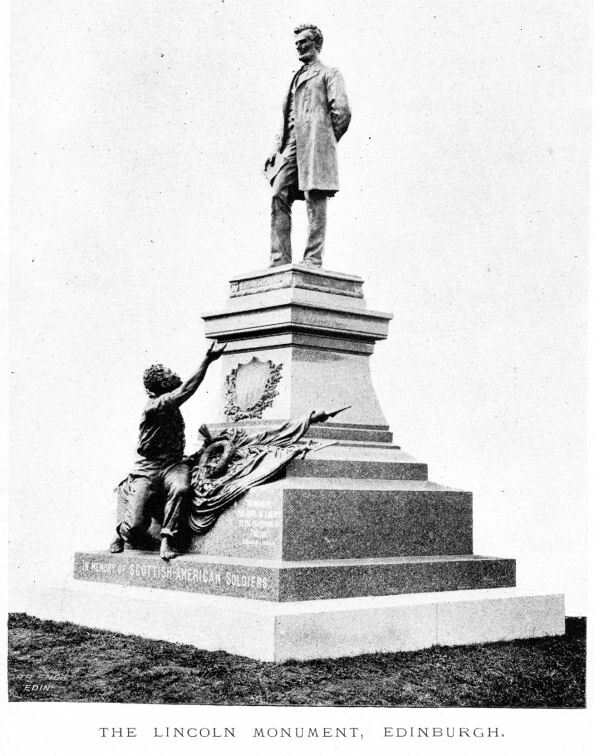 It is fifteen feet in height, Lincoln in bronze, life-size, with freed slave at his feet, and battle-flags also in bronze, base of polished red Aberdeen granite. Sir William Arrol, a true Scot and a self-made man, such a man as Lincoln would like to have known, was fittingly selected as chairman. A few years since Sir William Arrol was given the freedom of Ayr, and in his speech said, "Thirty years ago I walked through your burgh with my blacksmith tools, asking for work." Hundreds and thousands of Americans to-day look at his great Forth Bridge, a triumph of modern engineering. Mr Bruce, in inviting him, as chairman of the ceremony, fittingly said, "It is the problem of the future to bridge wide oceans and make one family of all nations. Your presence as chairman will rivet another link between our two great English-speaking nations." In the absence of the Honourable Chauncey M. Depew, who had promised to give the address, and fully expected to be present until the last moment, Mr Wallace Bruce presented the monument to the city. It has been a work of love on the part of the United States Consul. The idea was happy, and it has been gracefully executed. It will stand as a monument of love to old Scotia, and will form another link of friendship and goodwill between the nations. Each of the following gentlemen subscribe one hundred dollars to the undertaking. Geo. Peabody Wetmore, Newport, R.I.
J. E. Munger, Fishkill, N.Y.
S. D. Coykendall, Rondout, N.Y.
J. Watts de Peyster, Tivoli, N.Y.
Geo. E. Lemon, Washington, D.C.
J. B. White, Ft. Wayne, Ind. Edward White, Ft. Wayne, In. David C. Bell, Minneapolis, Minn.
Lynde Harrison, New Haven, Ct.
John Beattie, Leets Island, Ct.
Thomas Waddell, West Pitston, Pa.
Geo. W. Childs, Philadelphia, Pa.
Franklin Fairbanks, St. Johnsbur, Vt.